The Metallic Fidget Spinner features a low friction, SS bearings with a plastic metallic colored shell. Designed for anxiety and fidgeting, this spinning toy helps to reduce stress and maintain focus, especially in classroom and office settings. 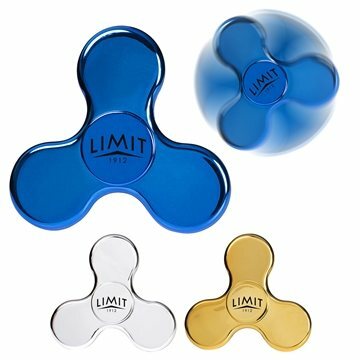 Metallic Fidget Spinners satisfy those who like to to jiggle, squirm, twiddle, twitch, bustle, fiddle, fuss, jitter, joggle, play, stir or wiggle! It spins for approximately 1:30. Very nice product and reasonably priced. the sales people at AnyPromo really helped us through the process! Rose always takes such great care of me. Never ONCE have I ever been let down. Thank you again! I especially appreciated the concern and effort of the sales people at AnyPromo, who answered all our queries and allayed all our concerns. We could not have been happier with this selection and the service received thanks Rosa!!! Good quality - imprint was Just as guaranteed! It was delivered as promised and the design and color was just the way i ordered it.